High quality replacement interior door panels. These quality replacement armrests, also known as interior door pulls, are available in black to fit stock and aftermarket door panels. Sold in pairs. Don't forget to order the brackets that install behind them if yours are missing! 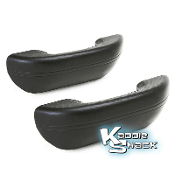 These quality replacement armrests, for Bugs and Super Beetles also known as interior door pulls, are available in black to fit stock and aftermarket door panels. Sold in pairs. 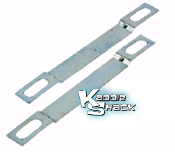 Don't forget to order the brackets that install behind them if yours are missing! 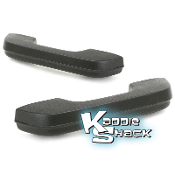 These quality replacement armrests, for Bugs and Super Beetles also known as interior door pulls, are available in black to fit stock and aftermarket door panels. Sold in pairs. Don't forget to order the brackets that install behind them if yours are missing! Armrest mounting brackets install behind the door panel to secure the armrest and prevent it from tearing through. We've found that many VW's are missing these, as previous owners have removed them. Slotted holes allow use with many different years.